Curve studied by Roberval and Viviani in 1692. Vincenzo Viviani (1622-1703): Italian mathematician. Initial name given by Roberval: cyclo-cylindrical curve. See also the mathourist's page. System of spherical equations: (longitude = latitude). Cartesian equation: (where ) or: (with ), form used in what follows. Rational biquadratic (quartic of the first kind). System of cylindrical equations in the frame (A, ) where A(a, 0, 0): . 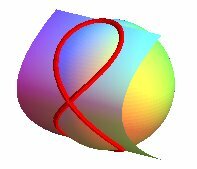 The total length is equal to the length of an ellipse with semi axes and R, written thanks to an elliptic integral, . Surface area delimited by the curve on the sphere (called "Viviani window"): ; as opposed to that of the circle, the squaring of the complement of this window on the sphere is possible (area = 8 R²). Volume of the solid shared by the ball and the inside of the cylinder (called "Viviani temple"): ; if we remove two symmetrical Viviani temples from the sphere, the cubing of the remaining solid (volume ) is possible. The Viviani curve is the intersection between a sphere with radius R (here, ) and a cylinder of revolution with diameter R a generatrix of which passes by the center of the sphere (here, ); it is therefore a special case of hippopede, a curve that is at the same time spherical and cylindrical, as well as a special case of conical rose. Therefore, we get a Viviani curve by sticking the tip of a compass inside a cylinder of revolution and tracing on this cylinder a "circle" with radius equal to the diameter of the cylinder. The Viviani curve is also included in a cone of revolution the axis of which is a generatrix of the above cylinder (here, ), as well as in a parabolic cylinder (here, ), which gives a total of 6 definitions of the Viviani curve as the intersection of 2 quadrics, and 3 definitions by the motion of a compass on a cylinder of revolution, a cone of revolution or a parabolic cylinder. By the way, the linear combinations of two of these quadrics gives a infinite family of quadrics that contain the Viviani curve, all of revolution except the parabolic cylinder. 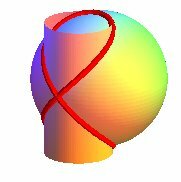 The Viviani curve is also a portion of the section of the Möbius surface by a sphere (section that also includes a great circle of the sphere). 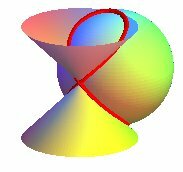 The system of spherical equations shows that the Viviani curve is a special case of clelia. Therefore, it is also the locus of a point M on a meridian of a sphere turning at constant speed around the polar axis, while the point M moves at the same speed along this meridian. 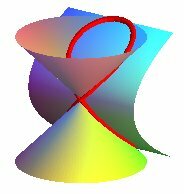 The system of cylindrical equations shows that the Viviani curve is also a special case of cylindrical sine wave. Therefore, if we develop the cylinder on which the Viviani curve is traced, we get a period of a sinusoid: , with . We thus easily obtain a Viviani curve by cutting on a sheet of paper the figure formed by two arches of sinusoids and glueing the tips. 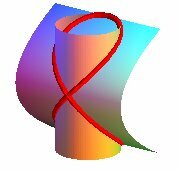 Opposite, an animation of a sheet delimited by an arch of sinusoid, that yields a Viviani curve. Parametrization: , with t between and , u between 0 and 1, and, in the animation, ranging from 0,001 to . Note that, halfway through ( ), the curve is a half-ellipse. If one end of a bar of length L is fixed on a vertical cylinder with diameter L, then the free end, when slipping along the cylinder because of the gravity, will describe the intersection between the cylinder and a sphere with radius L centered on it, in other words, a Viviani curve. A series of bars identical to the latter generates an elegant animation of hyperboloids of revolution (idea of Andre Hubert). A lot of planar rational quartics are projections of the Viviani curve. 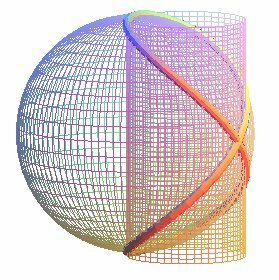 The stereographic projection from the North (or South) pole is the right strophoid with equation: . The stereographic projection from the point diametrically opposite the double point is the lemniscate of Bernoulli. The gnomonic projection (with center O) is a kappa curve. As we've seen above, the ratio of the area of the portion of half sphere located outside the two symmetrical Viviani windows over R² is rational, as opposed to the area of the half-sphere; Viviani had called it: vela quadrabile fiorentina (Florentine veil that can be squared). See also at surface of equal slope, the cone with center O that lies on the Viviani curve, that could be called "Viviani cone", the surface obtained by folding a cylindrical sheet of paper along the Viviani curve. (coordinate lines of the parametrization ). 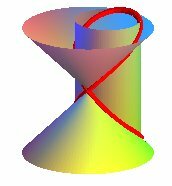 See also the cone parametrized by Viviani curves. 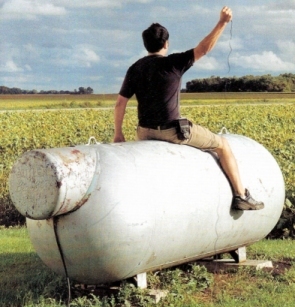 Who will notice the Viviani at the back of this rusted tank?